Test cricket is played between international cricket teams who are Full Members of the International Cricket Council (ICC). Unlike One Day Internationals, Test matches consist of two innings per team, with no limit in the number of overs. Test cricket is first-class cricket, so statistics and records set in Test matches are also counted toward first-class records. The duration of Tests, currently limited to five days, has varied through Test history, ranging from three days to timeless matches. The earliest match now recognised as a Test was played between England and Australia in March 1877; since then there have been over 2,000 Tests played by 13 teams. The frequency of Tests has steadily increased partly because of the increase in the number of Test-playing countries, and partly as cricket boards seek to maximise their revenue. Cricket is, by its nature, capable of generating large numbers of records and statistics. This list details the most significant team and individual records in Test cricket. As of January 2019, the most successful team in Test cricket, in terms of both wins and win percentage, is Australia, having won 385 of their 819 Tests (47.00%). Excluding teams who have only played a single Test (the ICC World XI, a rest of world team who played a single Test against Australia in 2005, and recent Test newcomers Ireland and Afghanistan) the least successful team are Bangladesh who have struggled since their introduction to Test cricket in 2000, leading to questioning of their Test status. Australian Donald Bradman, widely considered the greatest batsman of all time, holds several personal and partnership records. He scored the most runs in a series, has the most double centuries and was a part of the record 5th wicket partnership. His most significant record is his batting average of 99.94. One of cricket's most famous statistics, it stands almost 40 runs higher than any other batsman's average. Don Bradman is the only player in the world to have scored 5000 runs against a single opposition: 5028 runs against England. In the Manchester Test of 1956, England spin bowler Jim Laker took 19 wickets for 90 runs (19–90) which set not only the Test record for best match figures but also the first-class one. In taking 10–53 in the second innings he became the first bowler to capture all ten wickets in a Test match innings, and his analysis remains the best innings figures. Indian Leg-spinner Anil Kumble is the only other bowler to have taken 10 wickets in an innings, claiming 10–74 against Pakistan in 1999. West Indies batsman Brian Lara has the highest individual score in Test cricket: he scored 400 not out against England in 2004 to surpass the innings of 380 by Matthew Hayden six months earlier. Lara had held the record before Hayden, with a score of 375 against England 10 years earlier. Pakistan's Misbah-ul-Haq holds the record of the fastest Test half century, scoring 50 runs from 21 balls. The record for the fastest Test century is held by New Zealand's Brendon McCullum, who scored 100 runs from 54 balls in his final Test match. The trend of countries to increase the number of Test matches they play means that the aggregate lists are dominated by modern players. Sri Lankan spinner Muttiah Muralitharan became the highest Test wicket-taker in December 2007, when he passed Shane Warne's total of 708 wickets. 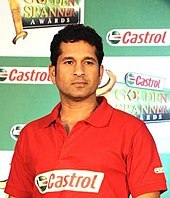 Within a year, the equivalent batting record of highest run-scorer had also changed hands: Sachin Tendulkar surpassed the tally of 11,953 runs by Brian Lara. The record for most dismissals by a wicket-keeper is held by Mark Boucher of South Africa while the record for most catches by a fielder is held by Rahul Dravid. In general the top five are listed in each category (except when there is a tie for the last place among the five, when all the tied record holders are noted). Domestic cricket seasons in Australia, New Zealand, South Africa, India, Pakistan, Sri Lanka, Bangladesh, Zimbabwe and the West Indies may span two calendar years, and are by convention said to be played in (e.g.) "2008–09". A cricket season in England is described as a single year. e.g. "2009". An international Test series may be for a much shorter duration, and Cricinfo treats this issue by stating "any series or matches which began between May and September of any given year will appear in the relevant single year season and any that began between October and April will appear in the relevant cross-year season". In the record tables, a two-year span generally indicates that the record was set within a domestic season in one of the above named countries. Andy Lloyd (10*, retired hurt). 22 players: see List of Test cricket triple centuries for more details. ^[c] Johnny Briggs equalled George Lohmann's record of 112 Test wickets on 3 January 1898 in the Second Test at Melbourne and overtook him in the next match at Adelaide. ^[a] John Ferris was one of a few cricketers to play Test cricket for more than one country. He played in eight Tests for Australia from 1886–87 and a single Test for England in South Africa in 1891–92. ^ "Classification of Official Cricket" (PDF). International Cricket Council. Archived from the original (PDF) on 29 September 2011. Retrieved 12 August 2009. ^ "The difference between Test and one-day cricket". BBC Sport. 6 September 2005. Retrieved 12 August 2009. ^ Williamson, Martin (14 March 2009). "Calling time on eternity". Cricinfo. ESPN. Retrieved 12 August 2009. ^ Williamson, Martin. "The birth of Test cricket". Cricinfo. ESPN. Retrieved 12 August 2009. ^ Martin-Jenkins, Christopher (2003). "Crying out for less". Wisden Cricketers' Almanack – online archive. John Wisden & Co. Retrieved 12 August 2009. ^ "Records – Test matches". Cricinfo. ESPN. Retrieved 12 August 2009. ^ Briggs, Simon (2 January 2009). "Twenty20 threatening Bangladesh Test status". The Telegraph. Retrieved 12 August 2009. ^ Marshallsea, Trevor (17 February 2006). "Ponting queries Bangladesh Test status". The Age. Retrieved 12 August 2009. ^ "Lillee rubbishes Bangladesh series". ABC News. 30 June 2003. Retrieved 12 August 2009. ^ Beard, Matthew (26 February 2001). "Donald Bradman, world's greatest batsman, dies at 92". The Independent. Retrieved 12 August 2009. ^ "Player Profile: Sir Donald Bradman". Cricinfo. ESPN. Retrieved 12 August 2009. ^ Davis, Charles (4 August 2007). "Could this be the Don's missing four runs?". Sydney Morning Herald. Retrieved 12 August 2009. ^ Leggat, David (23 August 2008). "The tainted stat that divides a nation". New Zealand Herald. Retrieved 12 August 2009. ^ "Records – First-class matches – Bowling records – Best figures in a match". Cricinfo. ESPN. Retrieved 12 August 2009. ^ "Pakistan tour of India, 1998/99". Cricinfo. ESPN. Retrieved 23 July 2012. ^ Fraser, Angus (13 April 2008). "Lara smashes magical 400 to rewrite history". The Independent. Retrieved 12 August 2009. ^ "Muralitharan breaks Test record". BBC Sport. 3 December 2007. Retrieved 12 August 2009. ^ "India v Australia 2nd Test". BBC Sport. 17 October 2008. Retrieved 12 August 2009. ^ "Eye injury ends Boucher's career". Cricinfo. ESPN. 10 July 2012. Retrieved 23 July 2012. ^ "Rahul Dravid announces retirement from international cricket". The Times of India. Times Group. 9 March 2012. Retrieved 23 July 2012. ^ "Match/series archive". Cricinfo. ESPN. Retrieved 16 August 2009. ^ "Test matches – Team records – Results summary". Cricinfo. ESPN. Retrieved 28 January 2019. ^ "Test matches – Team records – Largest margin of victory (by an innings)". Cricinfo. ESPN. Retrieved 8 January 2019. ^ "Test matches – Team records – Largest margin of victory (by runs)". Cricinfo. ESPN. Retrieved 8 January 2019. ^ "Records / Test matches / Team records / Tied matches". Cricinfo. ESPN. Retrieved 8 January 2019. ^ "England tour of Zimbabwe, 1996/97". Cricinfo. ESPN. Retrieved 30 December 2011. ^ "West Indies tour of India, 2011/12". Cricinfo. ESPN. Retrieved 7 January 2012. ^ "Test matches – Team records – Smallest margin of victory (by wickets)". Cricinfo. ESPN. Retrieved 8 January 2019. ^ "Test matches – Team records – Smallest margin of victory (by runs)". Cricinfo. ESPN. Retrieved 8 January 2019. ^ "Test matches – Team records – Victory after a follow on". Cricinfo. ESPN. Retrieved 8 January 2019. ^ "Test matches – Team records – Most consecutive wins". Cricinfo. ESPN. Retrieved 8 January 2019. ^ "Test matches – Team records – Highest innings totals". Cricinfo. ESPN. Retrieved 8 January 2019. ^ "Test matches – Team records – Lowest innings totals". Cricinfo. ESPN. Retrieved 8 January 2019. ^ "Test matches – Team records – Highest fourth innings totals in won match". Cricinfo. ESPN. Retrieved 8 January 2019. ^ "Most runs in career". Cricinfo. ESPN. Retrieved 8 January 2019. ^ "Record-holders for most number of Test runs". Cricinfo Blogs. ESPN. Archived from the original on 22 July 2012. Retrieved 20 March 2012. ^ "Most runs in each batting position". Howstat Test Cricket. Howstat. Retrieved 28 January 2019. ^ "Batting records". Cricinfo. ESPN. Retrieved 21 December 2017. ^ "Stuart Law, batting statistics in Tests". Cricinfo. ESPN. Retrieved 21 December 2017. ^ "Andy Lloyd, batting statistics in Tests". Cricinfo. ESPN. Retrieved 21 December 2017. ^ "Test matches – Batting records – Highest career batting averages". Cricinfo. ESPN. Retrieved 9 January 2019. ^ "Test matches – Batting records – Most runs in an innings". Cricinfo. ESPN. Retrieved 9 January 2019. ^ "Test matches – Batting records – Most runs in an innings (progressive record holder)". Cricinfo. ESPN. Retrieved 9 January 2019. ^ "Records – Test matches – Batting records – Most runs in a match". Cricinfo. ESPN. Retrieved 9 January 2019. ^ "Test matches – Batting records – Most runs in a series". Cricinfo. ESPN. Retrieved 8 January 2019. ^ "Test matches – Batting records – Most runs in a calendar year". Cricinfo. ESPN. Retrieved 8 January 2019. ^ "The worst batsmen, and the most runs between dismissals". Cricinfo. ESPN. Retrieved 21 December 2017. ^ "Adam Voges: Australia batsman takes Test average over 100 in New Zealand". BBC. Retrieved 21 December 2017. ^ "Highest individual scores in each batting positions". Cricinfo. ESPNcrcinfo. Retrieved 8 January 2019. ^ "Test matches – Batting records – Most runs in an innings as captain". Cricinfo. ESPN. Retrieved 8 January 2019. ^ "Test matches - Batting records - Carrying bat through a completed innings". Cricinfo. ESPN. Retrieved 8 January 2019. ^ "Test matches – Batting records – Most runs off one over". Cricinfo. ESPN. Retrieved 8 January 2019. ^ "Most hundreds in a career". Cricinfo. ESPN. Retrieved 8 January 2019. ^ "Test matches – Batting records – Fastest hundreds". Cricinfo. ESPN. Retrieved 8 January 2019. ^ "Test matches – Batting records – Most double hundreds in a career". Cricinfo. ESPN. Retrieved 8 January 2019. ^ "Records / Test matches / Batting records / Fastest double hundreds". ESPNcricinfo. Retrieved 4 March 2019. ^ "Ben Stokes Double-Hundred Video & Top 10 Fastest Double-Centuries of All Times". Total Sportek. 3 January 2016. Retrieved 4 March 2019. ^ "Test matches – Batting records – Most triple hundreds in a career". Cricinfo. ESPN. Retrieved 8 January 2019. ^ "Test matches – Batting records – View innings by innings list – Runs scored greater than or equal to 400". Cricinfo. ESPN. Archived from the original on 29 June 2013. Retrieved 8 January 2019. ^ "Most fifties in a career". Cricinfo. ESPN. Retrieved 8 January 2019. ^ "Test matches – Batting records – Fastest fifties". Cricinfo. ESPN. Retrieved 8 January 2019. ^ "Records–Test Matches–Batting records–Most fours in a career". Cricinfo. ESPN. Retrieved 8 January 2019. ^ "Records / Test matches / Batting records / Most sixes in career". ESPNcricinfo. Retrieved 4 March 2019. ^ "Test matches – Bowling records – Most wickets in career". Cricinfo. ESPN. Retrieved 28 January 2019. ^ "Australia v England in 1876/77". CricketArchive. Retrieved 30 August 2009. ^ "Evolution of most Test wickets". Cricinfo. Retrieved 8 January 2019. ^ "A Graphical View of India vs Australia, 2nd Test match, Chennai, played 14–18 October 2004". CricketArchive. Retrieved 30 August 2009. ^ "Test matches – Bowling records – Best career bowling average". Cricinfo. ESPN. Retrieved 8 January 2019. ^ "Test matches – Bowling records – Best career bowling average (without qualification)". Cricinfo. ESPN. Retrieved 10 January 2015. ^ "Test matches played by JJ Ferris". Cricinfo. ESPN. Archived from the original on 16 July 2012. Retrieved 15 August 2009. ^ "Test matches – Bowling records – Best career strike rate". Cricinfo. ESPN. Retrieved 28 January 2019. ^ "Test matches – Bowling records – Most five-wickets-in-an-innings in a career". Cricinfo. ESPN. Retrieved 8 January 2019. ^ "Test matches – Bowling records – Most ten-wickets-in-a-match in a career". Cricinfo. ESPN. Retrieved 8 January 2019. ^ "Test matches – Bowling records – Most wickets in a series". Cricinfo. ESPN. Retrieved 8 January 2019. ^ "Test matches – Bowling records – Best figures in an innings". Cricinfo. ESPN. Retrieved 8 January 2019. ^ "Test matches – Bowling records – Best figures in a match". Cricinfo. ESPN. Retrieved 8 August 2009. ^ "Test matches – Bowling records – Best figures in an innings as captain". Cricinfo. ESPN. Retrieved 16 March 2017. ^ "Test matches – Bowling records – Best figures in a match as captain". Cricinfo. ESPN. Retrieved 8 January 2019. ^ "Test matches – Fielding records – Most catches in career". Cricinfo. ESPN. Retrieved 8 January 2019. ^ "Test matches – Wicketkeeping records – Most dismissals in career". Cricinfo. ESPN. Retrieved 8 January 2019. ^ "Test matches – Wicketkeeping records – Most catches in career". Cricinfo. ESPN. Retrieved 8 January 2019. ^ "Test matches – Wicketkeeping records – Most stumpings in career". Cricinfo. ESPN. Retrieved 8 January 2019. ^ "Cricketers Who Have Taken 10 Wickets and a Century in a Test match". Cricinfo. ESPN. Retrieved 24 November 2014. ^ "Test matches – Individual records (captains, players, umpires) – Most matches in career". Cricinfo. ESPN. Retrieved 8 January 2019. ^ "Test matches – Individual records (captains, players, umpires) – Most matches as captain". Cricinfo. ESPN. Retrieved 8 January 2019. ^ "Test matches – Individual records (captains, players, umpires) – Most matches won as captain". Cricinfo. ESPN. Archived from the original on 11 March 2016. Retrieved 8 January 2019. ^ "Test matches – Partnership records – Highest partnerships by wicket". Cricinfo. ESPN. Retrieved 8 January 2019. ^ "Test matches – Partnership records – Highest partnerships for any wicket". Cricinfo. ESPN. Retrieved 8 January 2019.